The gay male world today is characterized by seductive beauty, artful creativity, flamboyant sexuality, and, encouragingly, unprecedented acceptability in society. Yet despite the progress of the recent past, gay men still find themselves asking, "Are we really better off?" The inevitable byproduct of growing up gay in a straight world continues to be the internalization of shame, a shame gay men may strive to obscure with a fa?ade of beauty, creativity, or material success. 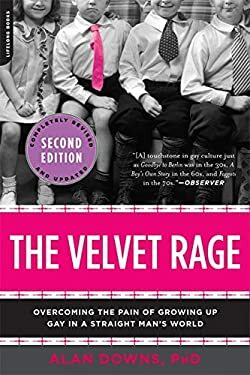 Drawing on contemporary psychological research, the author's own journey to be free of anger and of shame, as well as the stories of many of his friends and clients, "The Velvet Rage" outlines the three distinct stages to emotional well-being for gay men. Offering profoundly beneficial strategies to stop the insidious cycle of avoidance and self-defeating behavior, "The Velvet Rage" is an empowering book that will influence the public discourse on gay culture, and positively change the lives of gay men who read it. New (107 available) BRAND NEW. Over 1.5 million happy customers. 100% money-back guarantee. Make your purchase count: support Better World Books' worldwide literacy partners.